Way up in North Portland, where the Willamette and Columbia rivers converge, sits a bastion of old-school cool. It’s a place where decades-old dive bars coexist with artists’ boutiques, where longshoremen from the nearby port sit side by side with 20-something creatives, and where you can catch a live band, play bingo or trot out your trivia at one of the many bars and pubs any night of the week. 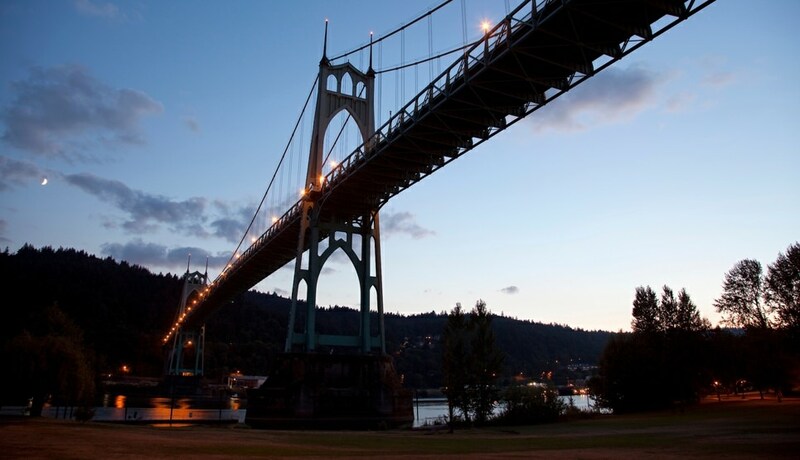 It’s this blend of tight-knit community and unpretentious charm that sets St. Johns apart. And with a recent boom in independent restaurants, breweries and coffee shops, there’s never been a better time to explore this eclectic neighborhood. Here’s everything you need to know to spend a weekend here. If you’re lucky, you’ve scored lodging at The Colony, a former funeral parlor turned event space with two midcentury-chic apartments and a sweet little vintage trailer out back. Once you settle in, put on your walking shoes, because everything that makes this neighborhood great is concentrated within a few short blocks. Any exploration of Portland must start at one of the city’s many small-batch coffee roasters, and St. Johns Coffee Roasters is happy to oblige with its organic and fair-trade coffees. 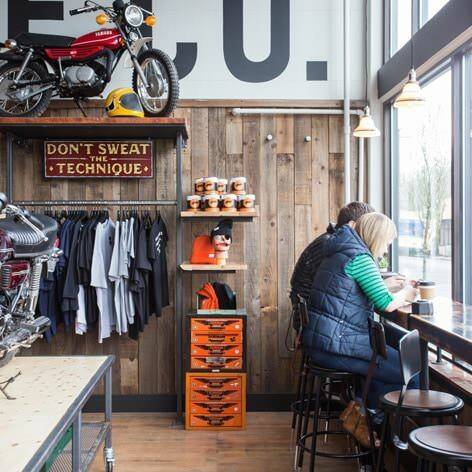 Or you can rev up for the day at Two Stroke Coffee, a two-level, motorcycle-themed coffee shop serving up Portland’s Water Avenue coffee, plus beer, wine and very cool swag. Grab a Fleur de Lis pastry or a Bowery bagel here, or walk two blocks to Anna Bannanas Cafe, a venerable, low-key coffeehouse with affordable and filling vegetarian scrambles. For a more full-service option, head to the light and airy John Street Cafe, known for its omelets and great outdoor patio. 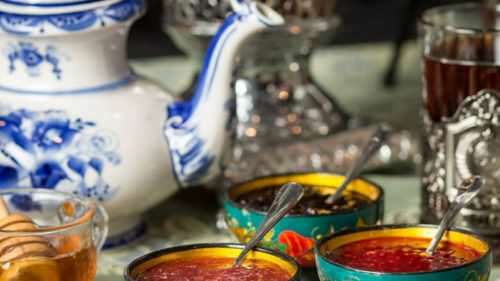 With a green chili omelet on your plate and locally roasted Kobos Coffee in your mug, you’ll be properly fueled to take on the day’s adventures. The area’s main business district along Lombard Street may be just a few blocks long, but it boasts a surprising variety of shops and boutiques. Geek out over the stellar collection of new, used and cult-worthy cameras at Blue Moon Camera and Machine and Machine. The Man’s Shop has been a go-to for tailored suits and Pendleton shirts for 75 years and counting. For screaming deals on previously worn duds, check out Hound & Hare Vintage and Consign Couture consignment stores. And then there’s Pattie’s Home Plate Cafe — part garage sale, part soda fountain and a beloved hangout among St. Johns old-timers for, well, ever. Among the relative newcomers are Art of STEM (science-minded books, games and activities for kids), Metamorphic (chic housewares, women’s clothing and accessories), Etcetera (artisan gifts and goods), Salty Teacup (locally made stuff with a hipster vibe — think tattoo salves and sea-creature hoodies), Zumbido de Portland (fair-trade items primarily from Latin America) and The Olive & Vine (for all your gourmet salt, oil, vinegar, tea and spice cravings). If your stay falls on a Saturday, check out the St. Johns Farmers Market (spring through fall) in the St. Johns Plaza. This is also the site of annual events like the Winter Beer Fest in December and the St. Johns Bizarre, a party of juried arts, crafts and live music held the second weekend in May, right after the St. Johns Parade, a community celebration that’s been going strong for more than 50 years. Down the street is one of Portland’s most beautiful attractions, Cathedral Park, at the base of the gorgeously gothic St. Johns Bridge. 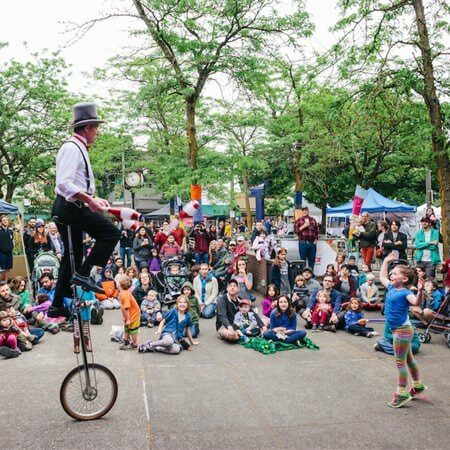 This is prime photo-op territory, and each July it’s also home to the 37-year-old Cathedral Park Jazz Festival, the longest-running free jazz fest in the West. A block away you’ll find the award-winning Moonstruck Chocolate factory. Pop in for truffles during weekdays and get a bird’s-eye view of the chocolate makers in action. When you’re ready to burn some energy, tee up at nearby Heron Lakes Golf Club, a certified Audubon sanctuary with two championship courses. Golfers of a different sort should grab their discs and head to Pier Park, regarded as one of the most beautiful and challenging disc-golf courses in the Northwest. Nature lovers can amble along the trails at Pier Park and picnic under the towering Douglas firs, or grab your binoculars and drive over to the Smith and Bybee Wetlands Natural Area, one of the largest urban freshwater wetlands in the country. 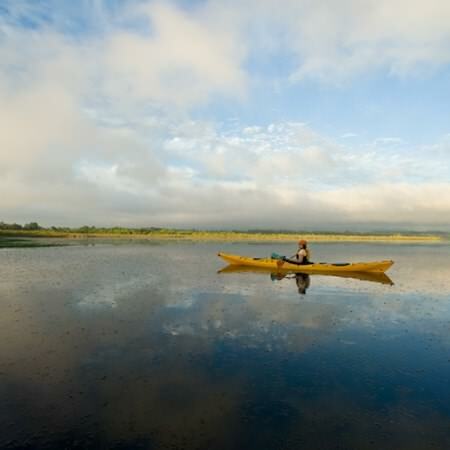 Walk the paved, half-mile Interlakes Trail and you might spot beavers, painted turtles, pelicans and bald eagles. 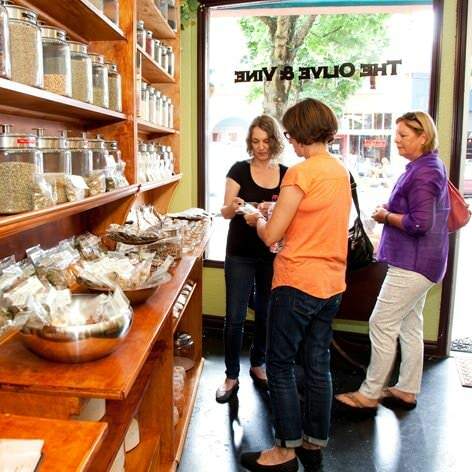 You’re also mere minutes from the nature hikes and farm stands that dot Sauvie Island, or the hiking trails of Forest Park, both just a short drive across the beautiful St. Johns Bridge. All that exercise is sure to work up an appetite. Vegans and health nuts should stop into Proper Eats Market and Cafe, an organic grocery with an attached vegan cafe. If you’re a taco fan (who isn’t? ), don’t miss local favorite Tienda Santa Cruz. Craving something different? Bite into a cheddar-bacon burger topped with kimchi at Mama San Soul Shack, or go with exquisite house-made pastas in a casual, counter-service setting at Gabagool, a popular cart that recently went brick and mortar. 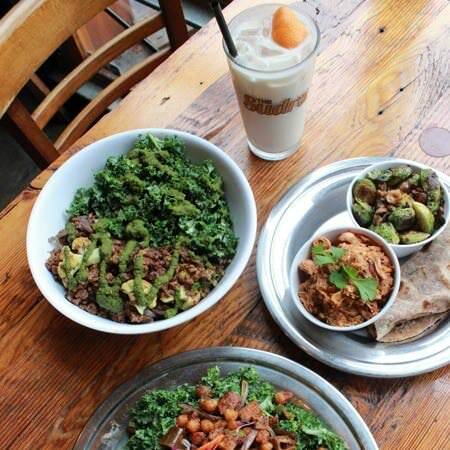 For flavor-packed vegan Indian plates, try Portland’s second outpost of The Sudra, where you can pair chicken-less tikka masala, enriched with cashew cream, with a pint from Royale Brewing Co.’s tasting room, The Garrison, next door. If it’s dinner and a show you seek, hit Girasole for wood-fired pizza, plus live music on Friday and Saturday nights. Or settle in for a slice and a beer while watching a new-release film at the St. Johns Twin Cinemas. 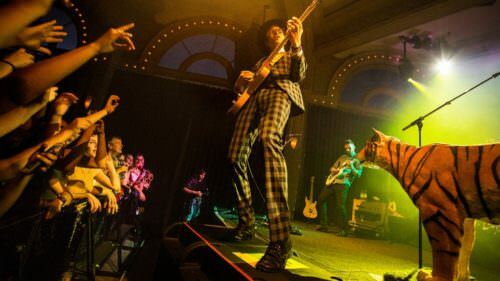 Though there’s only one movie screen at the McMenamins St. Johns Theater & Pub, the menu sports nine burgers, four dogs and a slew of sandwiches. Best of all, you can wash it all down with one of the iconic brewery’s beers. Speaking of beer, St. Johns offers one serious pub crawl. 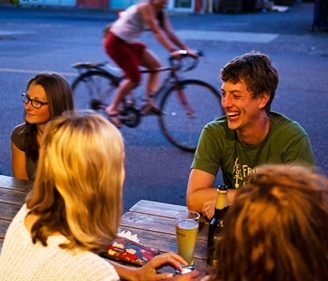 In addition to The Garrison and McMenamins, plus the dive bars pouring local craft brews, you’ll find Occidental Brewing Co. making some of the city’s favorite German-style beers. Stay for dinner at its new Wursthaus pub across the parking lot, where Urban German, a farmers-market food-cart favorite, serves brats, weisswurst and house-made pretzels. 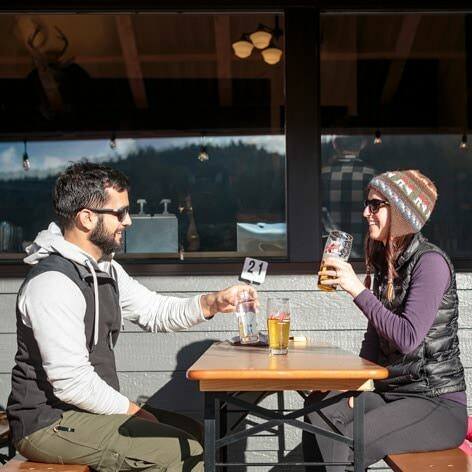 Anchoring the St. Johns Marketplace & Food Pod is the funky, outdoor, tent-covered Beer Porches. Raise a pint of Captured by Porches Brewing Company’s seasonal suds while you chow down on juicy burgers or stuffed baked potatoes from the merry band of food carts. Or you can take your food across the street to Lombard House, an itty-bitty beer bar with an expansive garden and 10 well-curated taps flowing with some of the city’s best local brews. For a relaxing beverage without the booze, SOMA Kombucha Speakeasy provides a self-serve, no-shoes, chilled-out space to dive into their revolving selection of fermented drinks and raw, vegan snacks. If you appreciate a good dive bar, you’re in luck, because St. Johns has an impressive concentration. Slide into the 105-year-old Slims, where there’s live music on weekends, a couple craft beers on tap and bar food that ventures beyond the fryer. 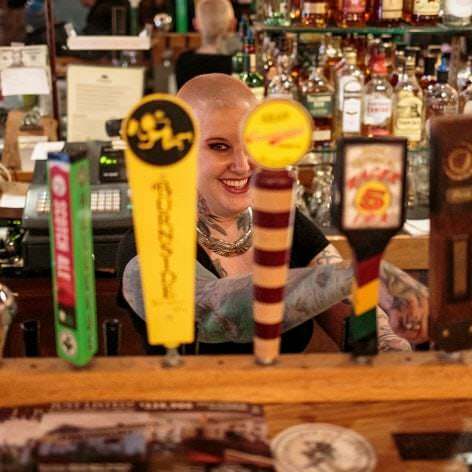 Most nights you’ll find bands playing at the eclectic Plew’s Brews, where the taps flow with mead, cider and special local beers. Same goes for The Fixin’ To, a taxidermy-bedecked, Southern-inspired hot spot where there’s always a DJ or live music playing, from hip-hop to honky-tonk, plus a heated patio and shuffleboard. 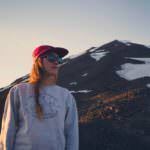 Looking for a mellow scene? Sip a cocktail and play a round of bocce on the back patio of Leisure Public House.